Can any software transfer data from my Android to iPhone? Recently I got news from my friend, he recommended Syncios Data Transfer for me, although charges little, but I'm not sure. Have anyone ever used this, too? Or could you recommend others? Thanks for your listening. You can actually transfer content without using any application that requires payment. Unlike the iPhone, the Android is much more flexible when it comes to manipulate the data. For example, you can copy music, videos, images, and all custom content by simply plugging the phone to PC and enable USB transfer then copy the data from DCIM folder (images), Music (music), Downloads (custom files), etc. To transfer the contacts, simply sync them to the Gmail account and add that account to iOS and then sync the contacts to your Apple account. To transfer the mentioned items, install iTunes and add them like you would normally do. There you go, all the content has been moved without apps that require money. I have used this method a couple of times and it has never failed me. Thanks for your answer, really help!! You method doesn't transfer everything from android to iphone, but a mobile phone transfer app does. i think it's more convenient. I reommend Syncios Data Transfer because I have been using this great software for quite a long time. I'm going to say from my heart that it is really good. If you use it to transfer between Android phone to iPhone, you will like it as me. To switch data between two devices with different operating systems is a little hard to acheive, but I think you can use Mobile Transfer to fix this issue to transfer data from Android to iPhone. Besides, iPad and iPod also are supported as well as lots of Android devices, like Samsung, HTC, LG, etc. Well, I am also a user of SynciOS Data Transfer. At least it works much better than iTunes and iCloud. It's quite handy. You can have a try. Hey, I recommend Jihosoft Phone Transfer. I recently switched from Samsung Galaxy S3 to a new iPhone 6S, and want to transfer all my stuff from the old S3 to the new iPhone. I found this tool from Google and it really helped me make the transfer. Sync contacts from android to iphone .Google account is the best choice.Backup your android phone contacts to google. Go to Settings on your Android phone and choose "Accounts and Sync" or similar. Enter your GMail account details and enable sync. For iPhone,you can go to Settings > Mail, Contacts, Calendars and add your Gmail account. Make sure Contacts are enabled for the account. Data cannot be transfered directly between android and iphone, cuz they are different operation system, so you need a data transfer tool. How to transfer contacts from android to iphone. You can use free "Move to iOS", if it can't meet your demands, then you can try third party phone transfer tools. Don't worry, there are a lot of mobile transfer softwares that can transfer data from your android to iPhone on PC. It can directly transfer data between mobile phones, no matter they are of the same operating systems or different! 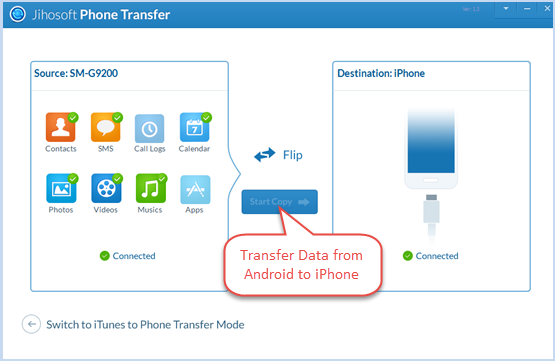 To transfer data from android to iphone, i think it's more convenient to use a mobile transfer app. You just need to connect your two phones to computer at the same time and start the app to transfer data, here you should set android in the source position and iphone in the desition position. Is it possible to clean my iPhone through Windows platform? How can I delete apps installed on my iPhone? How to transfer text messages from android phone to iPhone 6S Plus?